Landing the Ideal Place in Mexico. What Does Electricity Have to Do With It? “It’s like a meat locker in here!” roared John (a.k.a. Juan John) upon entering my apartment where I was lived in north Mazatlán, Mexico. Electricity, especially air conditioning, is a national obsession in Mexico. I glanced up nervously at the mini-split temperature gauge. I still can't convert centigrade to Fahrenheit that precisely. I felt like the Beggin Strips dog, “I can’t reeeead,” I told him. Plugging the high math into Google informed me that the room was a frigid 75 degrees. However, the scene reminded me to write to you about electricity billing because it plays such a big role in getting the lowest rent for beachfront condos in Mexico. If you buy a home in a coastal area, the cost of electricity will have a greater impact on your life than you can imagine. If a potential landlord believes that you know how the electricity game is played, he will be more likely to strike a good deal with you. Play by the rules the first time, and you will have references to confirm you understand the electricity rules and be able to bargain for incredible off-season rental rates. Electric bills in Mexico are complicated to read. The logic and structure of how they are calculated is even worse. The lack of understanding by most foreign travelers of how electricity is billed in Mexico is a big factor in keeping gorgeous beachfront condos unoccupied for most of the year. In hot coastal areas, in their humanity, the government subsidizes the cost of electricity during the hottest months. The months may vary slightly according to exactly which zone you're in (It's really pretty impressive the way they've figured it out). The government rewards good conservation habits with a subsidy during certain months and lower seasonal rates. After a certain level of use, rates goes up dramatically. Pricing is done on a sliding scale that makes it much more expensive the more you use. Meaning that the last 10% of a bill, if over a certain threshhold, can cost 10x more than the first 20% of the bill, get it? Many foreign residents, unlike the locals, have lots of electronics, pools and multiple air conditioners. Without careful oversight, electric bills can be four times what they pay in the States and eight times what a typical Mexican family pays. The “de alto consumo” rate on a bill is when you’ve crossed over the no-fly zone. Once there, you lose the subsidy, the seasonal rate and the lower rate you'd been initially given. And it gets worse. Once you are placed at that higher level, it may take a year to establish a better record of less usage and be placed back in the more economical level. Inside tip: if you accidentally fall into the high rate, put the bill in the name of a housemate, like the locals do. If you are entering a rental agreement, make sure you understand what the prior usage was so you will know at what level you are going to get billed at and make sure your place is billed “domestico,” not as a business. Check that your meter bill matches your address. Or you can have a great property manager, like I do. Make sure the past bill has been paid. The fear of coastal property owners is that guests and renters will run the A.C all the time, as they are used to doing at home, not only racking up the bill but penalizing the next occupants or them if they use the property, because rates are charged based on the annual average use. Houses in Mexico's coastal areas and places with real summers have “splits,” which are ubiquitous air conditioning units often located in bedrooms and living rooms only. People do not have central air in their homes. I wish we didn't have central air in the U.S. either. The Mexican system makes much more sense. Why air-conditiong a whole house when you spend the majority of your time in a few rooms? What happens in the U.S is that In an effort to lower elecrticity costs, people often have their temperature set too high or too low for the season. You are never be truly comfortable. I remember having dinner with friends in their beautiful, large home in Denver one winter and shivering the entire time. The owners had gotten used to setting their thermostat at 55 degrees. They were dressed for dinner in sweaters and woolen socks. I'm a skinny girl with little insulation. They didn't tell me I'd need my ski parka to dine with them. No one ever warns you. In Mexico, those "splits" I referred to are turned off when leaving a room. Doors to rooms not in use are shut off, keeping the cool air where it's being enjoyed. People use fans when they can. The highest temperatures of the year coincide with the highest subsidy and sometimes I do leave several splits on for a few hours. My electric bill for those months in never over $35 dollars for a 2,000 square foot, two level condo. That’s about the same bill I have in November if I use the air conditioner a several days - that’s how big the subsidy is. The behavior modifications to stay in the electricity safe zone in Mexico are pretty easy. You will feel good about making them if you like the idea of lessening your consumption footprint. Like your parents always told you, turn off unnecessary lights and keep the thermostat at a reasonable level in the room you’re in. Turn off the air conditioner when leaving the room. Remember to urn it off if you leave the house. The highest electricity consumers are pool water pumps, air conditioning and refrigerators so monitor how all appliances are used, not just the air conditioning. Be more careful about even leaving refrigerator doors open while you're unloading groceries, even for a few minutes. In Mexico, refrigerators will often beep when the door's been open too long, an actual alarm goes off. That's how serious they are about it. Choose energy efficient appliances. Washing machines are almost unheard of in Mexican rentals. Wash dishes by hand. Buy a portable rack to try small amounts of clothing, dryer use a lot of electricity and in coastal areas, clothes usually dry in a few hours anyway. Close curtains during hottest part of the day - all the things you should be doing anyway. If you use electricity wisely, your bill in Mexico can be much lower than you pay in the States. My electric bill for a small, one bedroom apartment in downtown Denver is between $80 - $110 a month in the summer. There are no viable lifestyle changes that will lower that to any meaningful degree. I like that I can affect my bill with good usage habits. Many an unaware expat who has purchased a home in Mexico has walked into this trap, receiving an electric bill rivaling a rent payment. I had the good fortune of my first summer being under tutorage of my housemate at the time, the Intrepid Elise, who walked behind me as I unloaded grocerties and gave me smoldering looks if I left the air conditioning in my bedroom on while making dinner. Americans have a very poor sense of what conservation really means. I sure didn’t. Electricity billing in Mexico is a topic much like visa requirements. Boring. Vital. It’s natural to feel a little unnerved about money when you’re in another country. Some banking basics. Most recent: Mexicans Circadian Rhythms are about two hours behind ours as Americans. Just enough to make a difference. Coming up: The first decision is to try out Mexico. The second is what to do with all that stuff. 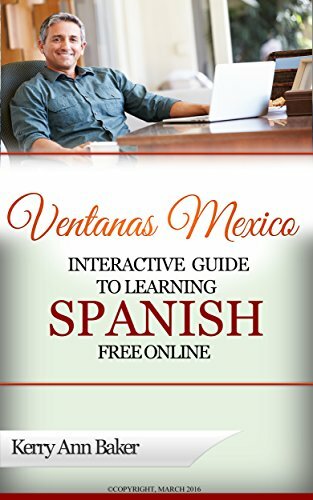 Kerry Baker is a partner with Ventanas Mexico and author of two books, the "Interactive Guide to Learning Spanish Free Online" which curates the best free tools on the web into lesson plans, geared for the self-learning potential expat. 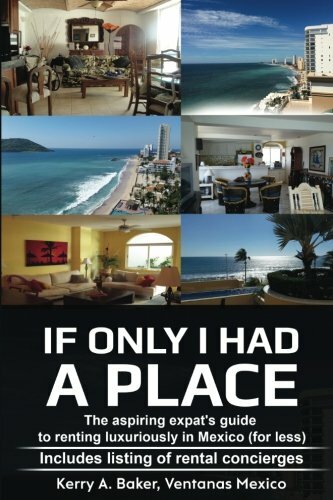 The new "If Only I Had a Place" is for aspiring expats seeking to rent well in Mexico, and includes a listing of rental concierges in Mexico's most popular expat areas.